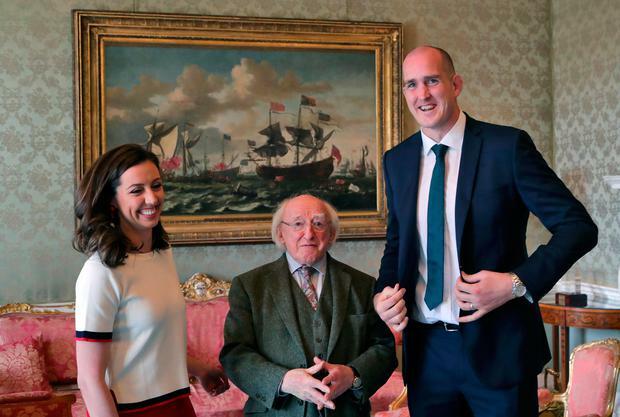 President Michael D Higgins welcomed Ireland head coach Joe Schmidt and his Grand Slam rugby heroes to Áras an Uachtaráin for a special reception yesterday. Leinster star Devin Toner and his wife Mary were among those who got the red carpet treatment in the Phoenix Park. The players and staff also brought along the Triple Crown and Grand Slam trophies to show off. Captain Rory Best and New Zealander Schmidt shared a joke with the President as they showed off their hard-earned silverware. The attention of the team will soon turn Down Under as they are set to embark on a three-game tour of Australia.